Are you an outdoor enthusiast who loves nothing better than to spend vacation time communing with nature in a beautiful park environment? Do you enjoy fishing, hiking, camping, boating and horseback riding? Or would you rather engage in water sports or mountain biking? Regardless of your choices for outdoor fun, you can enjoy any or all of them at Kentucky Taylorsville Lake State Park. Located roughly 40 minutes from Louisville, and about an hour from Lexington, this outdoor nirvana encompasses 2200 acres on the 3000 acre Taylorsville Lake. The town known as Taylorsville was named in honor of President Zachary Taylor’s father, Richard, a gristmill operator and landowner, who raised Zachary in the Louisville area. He owned thousands of acres, and donated some of them to help create the town. Taylorsville Lake, with its 75 miles of beautiful shoreline, was formed when the government later decided to dam the Salt River at the cost of almost 29 million dollars. The resulting lake, which aids in flood control and also provides recreational opportunities, opened to the public in 1983. Over 10,000 surrounding acres have been maintained as a wildlife preserve. Let’s explore the Kentucky Taylorsville Lake State Park, and see what it has to offer. It’s first and foremost feature is the lake, which has the reputation of being the most well-stocked fishing lake in Kentucky! At one time, a study was conducted to determine what type of fish would best thrive in the Salt River waters. Bluegill are especially prevalent, as are crappie, catfish and bass. No doubt the rule about fish being at least 15 inches to be legally kept when caught has something to do with the abundance found in this lake. For those who require it, there is even a handicapped-accessible fishing pier. The Taylorsville Lake Dock provides a boat ramp, food, gas, fishing-related supplies, boat slips and rental boats, to include both fishing and pontoon boats. There are also 4 other boat ramps throughout the park, at Settler’s Trace, Possum Ridge, Chowning Lane, and Van Buren. There is a park office, as well as a very nice visitors’ center that offers displays of the dam, boating, and the surrounding forest areas. Very close to the visitors’ center is a restored, 1800’s log school house. A short hiking trail provides some insight into local history. Nearby is a Wildlife Viewing Area with a hiking trail. The picnic area is located here, complete with grills and restroom facilities. If camping is high on your vacation list, then this park will not disappoint you. There is a 45-site campground area for RV’s, with shower and restroom facilities, and a central laundry. 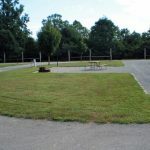 Online reviews indicate that the campground is especially quiet and relaxing, the water pressure is good, showers and restrooms are modern and clean, and the sites are overly large with easy access. One of the more unique features of this state park is the Horseman’s Campground. This special, 10-site campground is for you and your horse! Imagine, sleeping under the stars with your best buddy close by—it doesn’t get any better than this! While the sites are primitive, there are restroom and shower facilities here. Campers share the central laundry with the RV campers. There are many and varied hiking trails available throughout the park. Some tend to be better for horseback riding, some for walking, and even some for cycling. The Pete Campbell Trail, and Wildlife Viewing Trail are best for actual hiking, while the Beech Creek Loop and Snyder Hollow Loop accommodate both hikers and horseback riders. The Possum Ridge Loop and Salt River Vista Loop work well for hikers, cyclists and horses, although when the spring rains come, mud can be a problem. Throughout the year, there are some special events held in Kentucky Taylorsville Lake State Park. One of note is the Camper Appreciation Weekend held April 29-30, 2011. There is a Possum Ridge 5k race held in June of each year, and also a Halloween Campout in October. There are also numerous fun events and activities in the Taylorsville area, as well as restaurants, grocery stores, and anything else that you may require for an enjoyable stay in the area. The Sanctuary Art Center provides beautiful displays of quilts and other art. There are antique stores located close by, as well as Tanglewood, an 18-hole championship golf course. If you are making campground reservations, you might want to plan ahead, as reservations can be made a year ahead. You can make them online, or by calling 1-888-4KY-PARK. The park website is www.parks.ky.gov. The park re-opens for the season in April, 20ll. Get ready to have a fantastic outdoor experience in Kentucky Taylorsville Lake State Park!